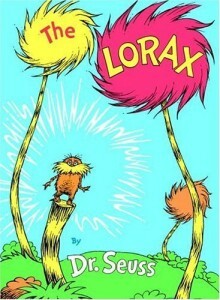 The Lorax by Dr. Seuss is a great story that teaches values about pollution, the environment and its abuses. The faceless narrator of the story puffed on a ginormous cigar for most of the story. Something that certainly shows how times are different today than in 1971. Recently I was returning on a flight from Chicago and was listening to the flight attendant safety speech. I was particularly interested in how much time they devote to telling the passengers that there is no smoking on the flight and that tampering with the smoke detectors in the lavatories is a federal offense punishable by blah, blah, blah. Smoking in public places, at least in the United States, is something that’s becoming more and more scarce. In 2010, I would say it’s more common to not be able to smoke in public places. Isn’t it about time that the messaging changes? Doesn’t it make more sense in time and resources to say you can smoke in the few remaining places you can smoke? There’s a lot of noise in the world and rules need to be shorter and sweeter. Cut to the point and lets move on. We can certainly start with some of the things that have been done for 10+ years, no? How about the things that nobody pays attention to? We do so many things on autopilot. Sure, once upon a time there was a valid reason. How about we start questioning why we do things once in a while? Stop doing what everyone else does. How many times are you driving at 1am and sitting at a red light and there’s nobody to be seen in any direction? Can’t the majority of traffic lights be alternate flashing yellow & red after a certain time at night? I bet it would cut down on pollution and make people less frustrated on late night drives. What things would you like to see changed? What was the first CD you remember?